Pictures Reframed acts as the epicenter of Leif Ove Andsnes’s 2009-10 recital season. The highly acclaimed Norwegian pianist and the no less successful South African graphic artist Robin Rhode (1976) have been developing this project, supported by Norway’s Statoil, a leading company in international natural gas and oil production and one of the large operators on the Norwegian Continental Shelf. Statoil is also the company that provides substantial financial means for individuals with the ability to think outside the box and to make the impossible possible. People with the skills and determination to achieve remarkable results. They hold the key to a successful future, not just for a company like Statoil but for society as a whole. Statoil calls them the 'heroes of tomorrow'. These are, in short, Statol's motifs for its extended scholarship progam. Back in 1990, Leif Ove Andsnes (1970) was the first artist to get a Statoil sponsorship and it was again Statoil generously underwriting the Pictures Reframed project and acting as its commissioning sponsor. Andsnes is arguably one of the few highest ranking artist of the prestigious London based record label EMI Classics No wonder that EMI jumped into this challenging project by producing and marketing a CD and DVD, handsomely packed in a deluxe book (all copies of this edition are individually numbered), containing Robin Rhode’s highly impressive art work for this project, in full-color (a single audio CD is also available).. Modest Petrovich Mussorgsky’s ((1839-1881) piano suite Pictures at an Exhibition, based on paintings by Viktor Alexandrovich Hartmann (1834-1873), is at the heart of this project. Andsnes performs the music on the rostrum, with Rhode’s video graphics projected at the same time onto a specially designed stage set. Rhode’s basic setting comprises five graphically printed large panels orbiting the stage, evoking a room within an exhibition. The central video projection itself acts as an optic ‘window’ absorbing the eye of the spectators. 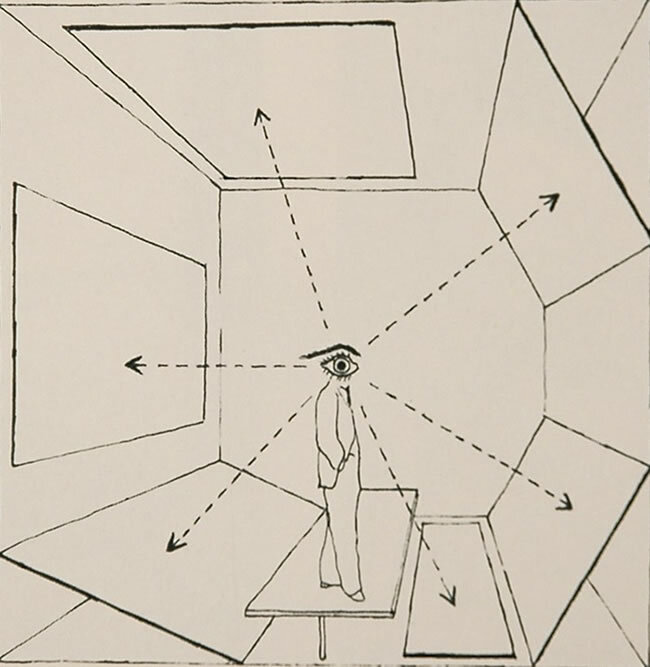 Rhode was strongly inspired by the Bauhaus artist and teacher Herbert Bayer’s famous diagram from 1935 depicting the eye’s perception of three-dimensional space; Bayer’s illustration shows a figure surrounded by geometric planes and their awareness of a 360 degree field of vision. 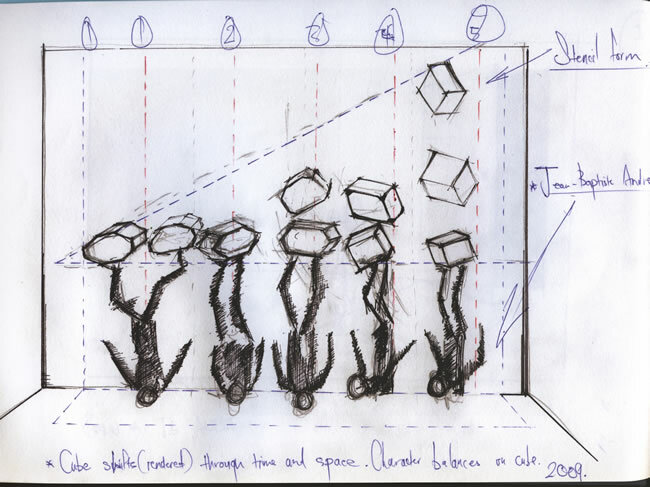 The painted panels show ‘activated’ spray painted forms (many taken from stencils used in the accompanied animations); as if they are moving through space across the panels, unconfined by their constraints, creating a perception of the stage, shifting, rotating, along with the musical and visual narratives. 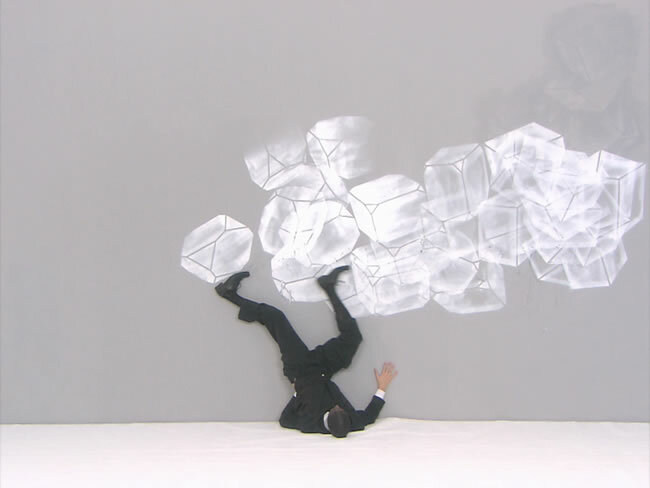 This graphic installation remains the fixed stage set within the ever-moving images and the music. One of the main themes in Rhode’s art work is childhood. In his new film Kid Candle Rhodes has captured ideas about childhood through the simplicity of a single stationary camera, with a white wall as the stage, and a basic line drawing. Rhode maintains that any situation or any struggle can be met with triumph and joy and that the imagination can make fantasy reality. Rhode has emerged as one of the most exciting young artists avoiding the limitations of working in one single artistic realm. He regularly uses drawing, video and photography techniques to create multi-disciplinary pieces of art. His graphics often contains physical human interactions with the images he creates. 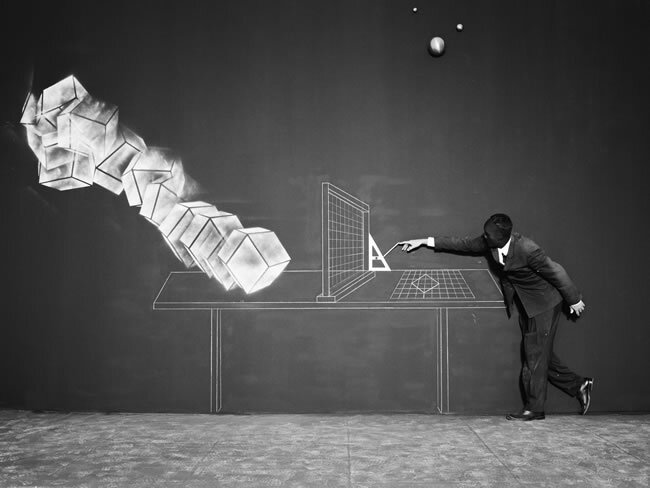 He draws commonplace objects on walls or on the floor, then takes photographs or films. By using these objects he shapes a sequence of events, a fluid action or interaction. His work is either convincing or controversial because of its ability to straddle both these opposite worlds: the real and the imaginary. Rhode sees the world as a huge sheet of paper, with each and every spot as a potential framework for his art. Rhode's work is exhibited at a.o. the Museum of Modern Art (MoMA) Solomon R. Guggenheim Museum and Perry Rubenstein Gallery in New York, Goetz Collection in Munich, Johannesburg Art Gallery and FRAC Champagne-Ardenne in Reims. At breakfast, Rhode’s emphasized in his fluent South African accent that he had thoroughly done his homework after Andsnes had finally asked him to participate. He did not know Mussorgsky, let alone the Pictures and it took him some time (much too long as far as the impatient Norwegian pianist was concerned!) to get into it, and to liaise with Hartmann’s paintings as well. It was not only a matter of understanding it all, what it was all about, but also really getting into it, by grasping each and every detai of it. The main question was of course: where did this almost violent music come from? It was the early death of his friend, the architect and designer Viktor Hartmann, which spurred Mussorgsky to compose his Pictures at an Exhibition, after he had attended an exhibition of Hartmann’s work to commemorate his artistic life. Hartmann’s pictures all have titles and Mussorgsky must have been quite impressed if not overwhelmed by their presentation at the gallery because we can clearly hear how the composer meticulously depicted these in sound in such a fashion that we can almost see them through our mind’s eye. There is no question about it: this is in each and every sense supreme program music which is quite strongly rooted in Romantic Russia of the second half of the nineteenth century. Mussorgsky’s music withstood the test of time, but Hartmann’s paintings did not. As it so often happens, history has been far from kind to Hartmann’s art, and most of his work is lost, as are most of his paintings. Nowadays we can only ‘view’ Hartmann’s paintings through Mussorgsky’s music. And how realistic that music is! We can almost see that dragging Polish cart on enormous wheels as being drawn by those oxen (in Bydlo), and we can hear the vividly ‘painted’ quite busy market scene at Limoges with a group of French women quarreling and gossiping. As we can shiver when faced with the stacked skulls in those dismal Paris catacombs. The Great Gate of Kiev is depicted in the awe-inspiring great finale, in true Russian romantic fashion, building one arresting climax after the other. It may be argued that this very strong music does not need any visual aids. It has been done without them for years, as part of a great and well established tradition. Why should that be changed? 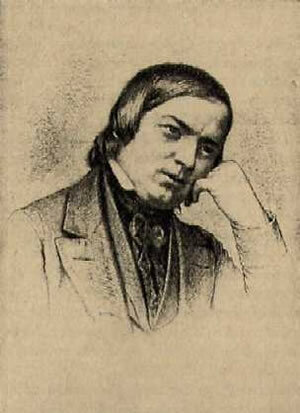 And especially when the Pictures are in the hands of one of today´s greatest pianists. Andsnes has been referred to as an “eminently sensual musician, an artist capable of grace and introspection” (Financial Times) whereas BBC Music Magazine commented on how hard it was to over-praise the vitality and distinction of this princely pianist; an aristocrat among his colleagues who has the gift of uncovering new depths without any loss of spontaneity or the slightest trace of artifice. The New York Times marked Andsnes as a pianist of magisterial elegance, power and insight in repertory including Mozart, Schubert, Prokofiev and Bartók (but nothing about his incredible ability to performing contemporary music…). Rightly so, not one word too many, it is all spot on. Andsnes is indeed one of those rare miracles of the present musical world, who demonstrates his almost boundless versatility time after time, no matter whether he lays Schumann, Rachmaninov, Dalbavie, Sørensen, or Kurtág. His playing range goes back to Bach and could end up with a work that was composed just a few months ago. As an exclusive EMI Classics artist, Andsnes has recorded over 30 discs, been nominated for seven Grammies and awarded many international prizes including four Gramophone Awards to date. He received Norway’s most distinguished honor, Commander of the Royal Norwegian Order of St. Olav. In 2007, he was awarded the prestigious Peer Gynt Prize by members of parliament to honor prominent Norwegians for their achievements in politics, sports, and culture. Andsnes is a professor at the National Academy of Music in Oslo, a visiting professor at the Royal Music Conservatory in Copenhagen and a member of the Royal Swedish Academy of Music. Why would such an artist want to meet a challenge like this? Did Andsnes want to focus on attracting more young people to his concerts, those who are maybe going to art galleries, who are interested in contemporary art, but who don't think that classical music is fashionable? He had been thinking for years about how he could merge with another art form. Sitting with friends in a New York café the idea came up to do something with film. He discussed it with the management of Lincoln Center, where they put him in touch with Laurence Dreyfus in Paris, an expert in the video art domain and who showed him the work of a variety of artists. It was here, where Robin Rhode’s art work generated the synergy Andsnes needed. Andsnes: “I found his work really very, very special. There was a lot of musicality and poetry in it.” But at that time Rhode’s name did not ring any bells for Andsnes, as they did not for Rhode when he met Andsnes in Munich, in 2007, at Rhode’s first European exhibition. For Rhode, a hip hop fanatic, classical music was unknown territory, a blank spot in his very busy life. But after the meeting with Andsnes he got electrified and watched YouTube videos of him over and over again. As far as Rhode was concerned this was all very fascinating stuff from another world. And he definitely wanted to take part in that. And Andsnes? Rhode appeared to be the creative artist to canalize his eagerness to do it all different this time, after nearly two decades of traveling around the world and giving concerts and recitals here, there and everywhere. Somehow, he saw the realization of his idea, incubated over a rather long period of time, not to commission new music but to put forward an additional dimension to his music making, albeit as a kind of experiment. Further along the road it did not take much pondering to arrive at Mussorgsky’s Pictures at an Exhibition, a work that was so much inspired by another art form, painting. What is exactly the ‘childish’ element in Andsnes’s recital program? It also contains Robert Schumann’s Kinderszenen (visually ‘accompanied’ by Rhode’s Kid Candle) and Mussorgsky’s unfinished Memories of childhood (1. Nurse and I and 2. First punishment: Nurse shuts me in a dark room). Andsnes explained in one of the program notes that Mussorgsky’s narrative in Pictures at an Exhibition has always made him think of the gallery visitor as an innocent, rather naive soul (perhaps even a child) marching in to see the exhibition, in complete ignorance of what he will encounter. 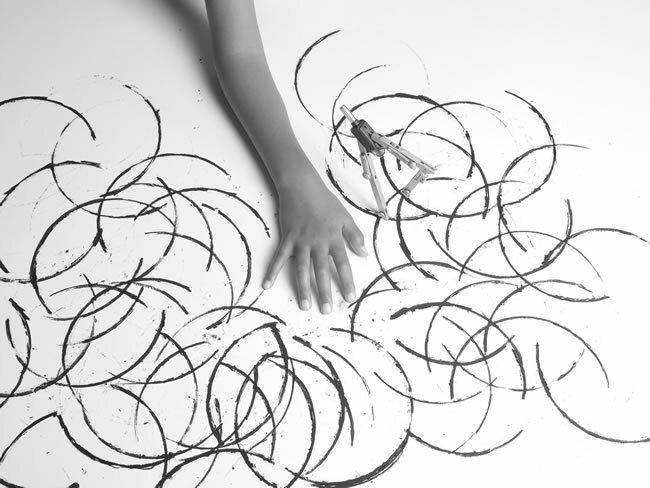 Robin Rhode’s children animations were some of the first pieces of his art Andsnes saw, and the inventive playfulness impressed him. When they worked on Pictures Reframed it struck him that the entire program of the evening could have a childlike spirit. 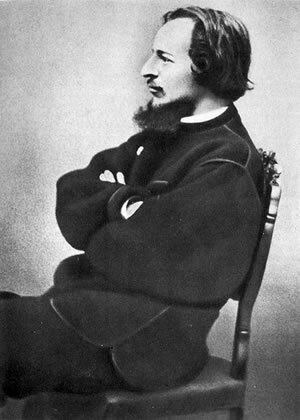 He wanted to include Schumann’s Kinderszenen, Mussorgsky’s From Memories of Childhood (only two movements exist), and Thomas Larcher’s new piano cycle What becomes, a piece being partly composed in collaboration with Robin, who created two new ‘children-animations’ to be shown together with the second and last movement of the piece. However, there is much more to be explained. So let's follow Rhode’s own program notes from here. “In Promenade 3 the ‘Kadet’ stumbles within his geometric surroundings, almost as if he is drunk. 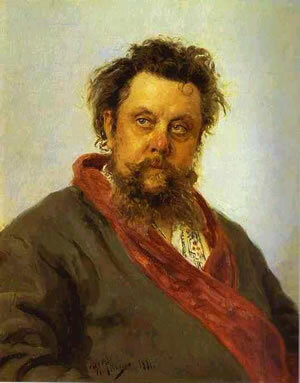 Mussorgsky’s own alcohol abuse surfaced in his youth already whilst serving in the army. 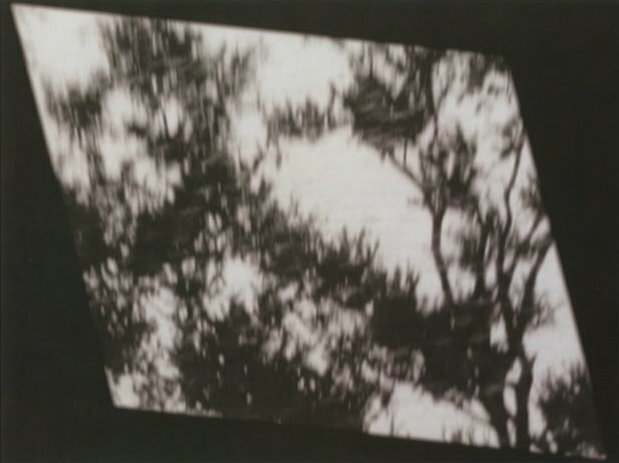 The visual accompaniment in this Promenade alters the frame as if it is depicting the ‘Kadet’ from an aerial perspective: "The visual device alters our perception of space, as if – being guided by the character – the ‘Kadet’ is stumbling, searching for his reality, while rejecting because he is intoxicated.” The audience may not be obliged to think about all of this, but there is a lot to ponder about nevertheless! The video depicts a forest in the shape of a pentagon. The shape refers to architectural diagrams and models - I was specifically looking at the pentagonal shape of the Castle of Good Hope situated in Cape Town, South Africa. The Cape Castle was designed in the 1660’s by the colonialists as a mechanism to prevent attack from any geographical side. 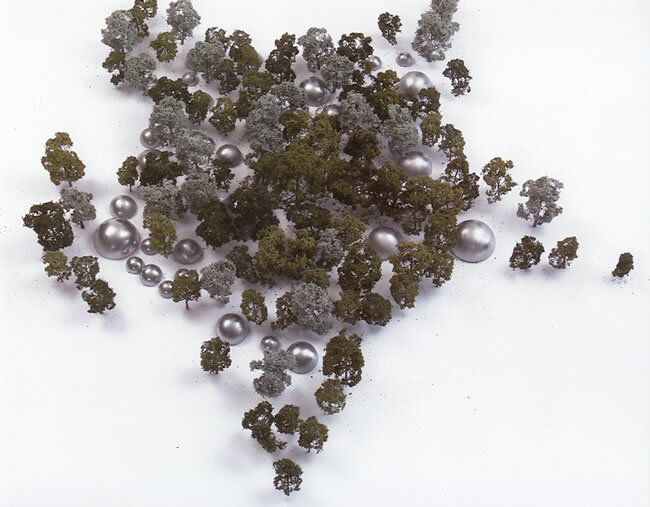 As time passes in the animation, we see metallic spheres begin to appear amongst the trees as if a humanised construction challenges the natural landscape. The pentagonal forest begins to shift outwardly in the shape of a five-pointed star. In many of Hartmann’s architectural drawings he adorned the sketches with human figures to indicate scale. In his painting of an old castle in Italy Hartmann suggests the size of the building with the figure of a troubadour singing in a serenade-like manner. The interesting depiction of the troubadour extends beyond the notion of architecture vs man, but also towards a poetical fiction and rhetoric that is inherent with troubadour songs, poems, and music. This Promenade movement appears vigorous and confident while the recurrent character of the Promenades, the ‘Kadet’, is assailed by a cloud of diamond shapes that begin to overwhelm him. Slowly the geometric forms subside like a tidal wave, allowing the character to grasp out and almost control the nature of these abstract shapes. This shape relates to a rhombus, a geometric form defined by the Greek mathematician Euclid, ‘The father of Geometry’, as something that ‘spins’. In the end the character, or ‘Kadet’, grasps a corner of the rhombus as if to make sense of his fictional world. Hartmann painted a watercolor of the famous gardens of Paris and enriched it by including a group of quarrelling children. The geometric shape - the rhombus - in the visual component appears again, this time as a window that references the shape of a kite, almost passing through a path of trees as if being guided by a breeze. Bydło is a Polish word meaning ‘cattle’. Hartmann spent a month in the Polish town of Sandomir. Whilst on this trip the artist sketched many ghetto scenes and happenings. Hartmann was deeply conscious of society’s social struggle. Therefore ‘Bydło’, the ox cart, could also be seen as a symbol for the poverty and suffering of the people of Sandomir. 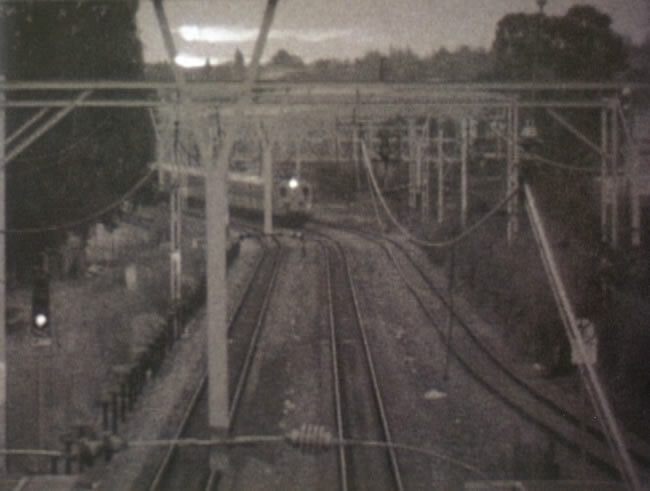 The visual accompaniment is a black and white film (transferred to video) depicting the surrounding area of a train station. The metal fence with its barbed wire, the dried grass blowing in the wind, a black bag caught on wire fencing, all depict a social decay frozen within a single location. The train also has a strong significance to South Africa’s dark political past. Masses of people from rural areas suffering under the constraints of Apartheid Laws travelled long distances into the cities for employment in the surrounding gold mines. The train and Bydło share a common symbol. The image of the train arriving and then departing from the station without anyone disembarking becomes a powerful metaphor for loss. As within European history, when filmed in grainy monochrome footage the train relates specifically to the persecution of the Jews during the Second World War. Millions of people were taken by train to death camps and this visual accompaniment becomes a reminder of the dark struggle for forgiveness that still informs our present history. This visual animation depicts a table in the form of a drawing apparatus used by artists and architects in the 16th century. The function of the apparatus is to place an object or still life on one side of the table; a grid or graph paper is placed on the other half on which to draw. 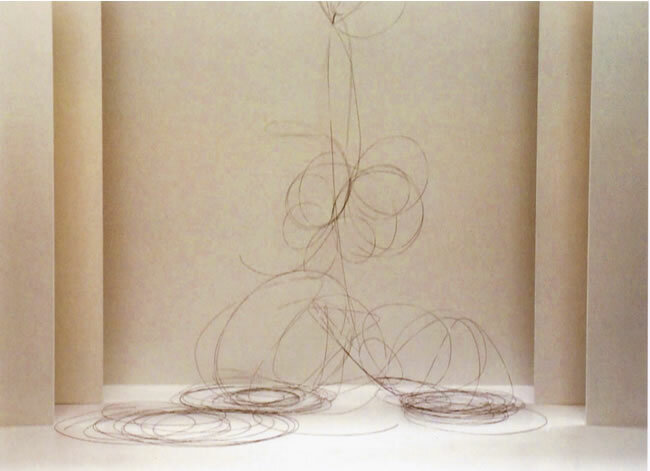 Using the string grid situated in the centre of the table the artist is able to view through and scale the subject by using the string grid as an optic scaling mechanism. In this Promenade the artist begins to draw at first a rhombus or diamond shape on his paper. While engaging with the drawn outline the rhombus appears as a three-dimensional form on the other side of the string grid. The object thus functions as an extension of the artist’s imagination: reality appears first as fiction. The rhombus then projects itself metaphysically into space while the artist balances a triangle on the apparatus. 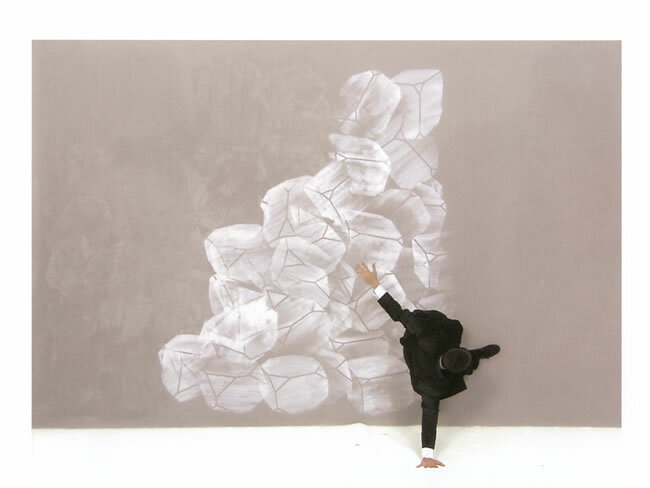 This activity functions as a mechanism to deny gravity as the artist’s spheres begin to elevate into space, almost mimicking the movement and projection of the drawn rhombus. Question: “Why is the rhombus a shape that is very present in this sequence and in Promenade and Kite? Rhode: “The interest in the rhombus shape extends beyond the geometric but also towards the diamond form and its meaning. A diamond possesses unique physical properties. As one of the strongest and valuable minerals, it also inherits properties relating to light refraction. 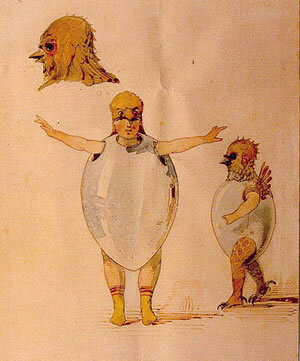 Hartmann’s sketch is that of children in chicken eggshell costumes for the Russian ballet ‘Trilbi’. The visual accompaniment to this movement begins with a child formally introducing a compass into the picture frame. The frame, a white positive space, functions as a dance floor or stage. This introduction between child and mathematical instrument appears as if partnered in a choreographic dance. The compass is then set free by the child and, with its two legs moving briskly across the white surface, it leaves outlined arc-like traces as if embodying the spirit of a ballerina. Mussorgsky’s movement is referred to as ‘Samuel Goldenberg and Schmüyle’. 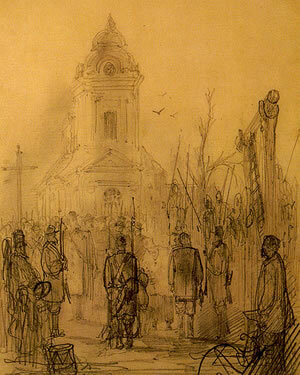 The music is descriptive of one of Hartmann’s drawings from the Polish town of Sandomir. Here Hartmann again refers to the economic and social differences of that time, between the rich Jew and the other, a dirt-poor beggar. It’s a scenario depicting the noble vs tragic. Mussorgsky’s picture (both drawings were his own property) carries this emotion very clearly into the music with the exaggerated self-importance of the rich man and the apprehensive, timid beggar. The visual accompaniment consists of a graphic black and white animation depicting symbols taken from banks around the world. Here the bank symbols are rendered superfluous as they morph from one symbol into the next. The formal property of each symbol functions as an optic device. Its graphic nature symbolizes a split second narrative that becomes frozen on the retina of the eye. These symbols begin to represent our economic climate in a way that is both abstract and relative, inclusive and exclusive. We see the ‘Kadet; character reappear, leaning on a wall that is at the same time the ground, stumbling as if in a drunken state. With difficulty he manages to balance himself onto the cubes under his feet, that in one moment become his ground or promenade while in the next vanish, thus leaving the ‘Kadet’ perplexed in his current state. This visual component relates directly to Mussorgsky, himself an abuser of alcohol, walking awkwardly towards the next picture in the exhibition. Hartmann painted more than 150 watercolors in Limoges. These paintings celebrated the cathedral, others depicted picturesque scenes of women in the marketplace quarrelling. It was this scene that inspired Mussorgsky’s movement. 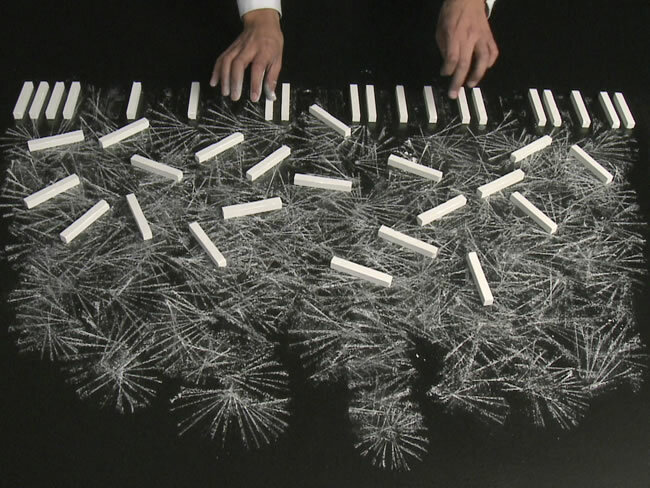 The Chalk Piano visual component uses this movement as a breakaway from Hartmann’s pictures, exploring the possibility of the piano as an instrument that could compose a picture (in this case with chalk) if your imagination allows it to. A row of chalk is lined up in the form of the piano keys. As the fingers of the pianist begin to touch the chalk the pieces shift across the blackened space creating starburst lines. The creation of these lines mimics the fast paced rhythm of Mussorgsky’s movement while the pianist struggles to maintain the fast tempo. The chalk keys rotate on the black surface creating a white trace, a remnant of the sound evoked by the keys when touched by the finger of the pianist. This haphazard routine creates tension between visual and audio, a conflict which highlights the true source of Hartmann’s image. The visual component is white abstract ink that splatters across a black space. The painted action denotes a clear emotive rupture when the white mark is thrown into the black void before it slowly disappears. An emotive moment becomes shortlived, ephemeral. When the Promenade theme recurs under the title Con Mortuis in Lingua Mortua a character in shadow silhouette is seen standing inside the picture. 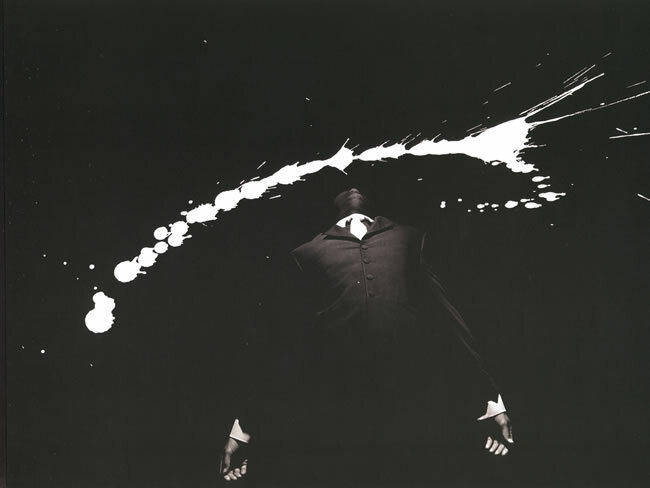 The character symbolically relates to Hartmann, re-appearing in a dream amongst splashes of ink strikes. 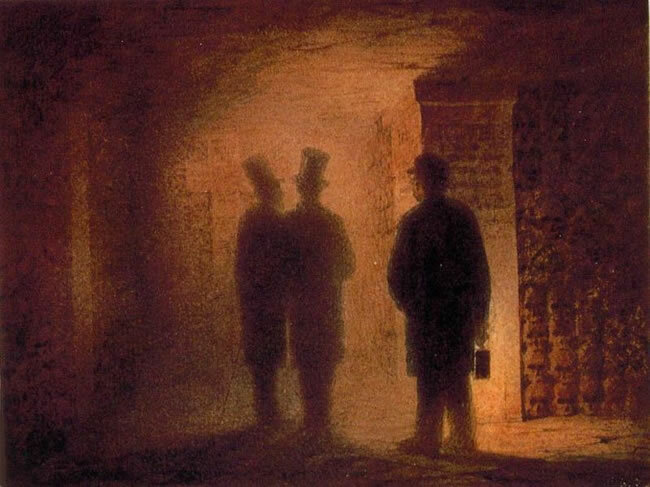 The white ink and ghost become Hartmann with lantern in hand generating light into the bowels of the catacombs. According to Russian folklore, Baba-Yaga refers to a witchlike character who dwells in a wooden house which stands on hen’s legs. 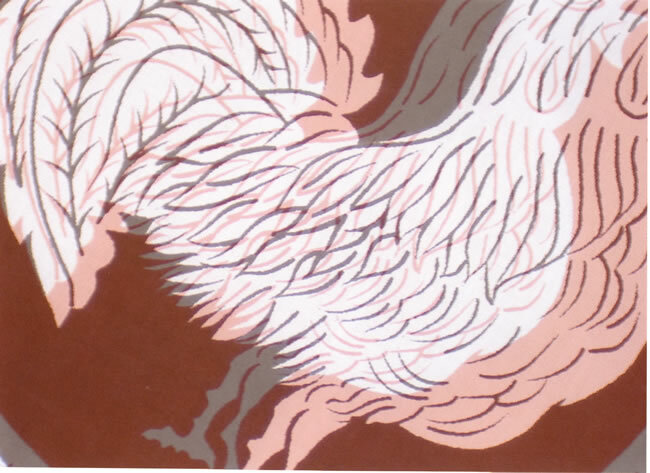 Hartmann had designed a clock in the shape of Baba-Yaga’s wooden hut standing on chicken feet. Mussorgsky’s movement however relates more to Baba-Yaga and her flying through the air rather than the actual clock designed by Hartmann. For the visual accompaniment I used printed fabrics used by Southern African witch doctors, known as sangomas, who practice a form of traditional healing. They perform a holistic and symbolic form of healing, embedded in the beliefs of their culture that ancestors in the afterlife guide and protect the living. Sangomas are called to heal, and through them ancestors from the spirit world can give instruction and advice to heal illness, social disharmony and spiritual difficulties. In many cases a ritual sacrifice of an animal is performed, usually a chicken. The spilling of this blood is meant to seal the bond between witch doctor and the spiritual ancestors. The colors represented in the visual component - black, white and red - are the sacred colors of sangomas in Africa. The color white represents spiritual love, purity and virginity. Black represents sorrow, despair, death, marriage and regeneration. Red represents physical love, strong emotion, anger and heartache. The color blue embodies the holistic state of the sky. These three colors, white, red and black, also refer to a Russian fairytale ‘Vasilissa the Beautiful’, collected by Alexander Afanasyev. In the fairytale Vasilissa is sent to the house of Baba-Yaga to collect light. During her time at the house she discovers three riders who pass by the house of Baba-Yaga. The first rider in the color white represents Day, the red rider the Sun, and the black the Night. The visual component essentializes the meaning of Baba-Yaga in a formalistic sense, thus beginning to touch on aspects of the spiritual world and its meaning in contemporary society. 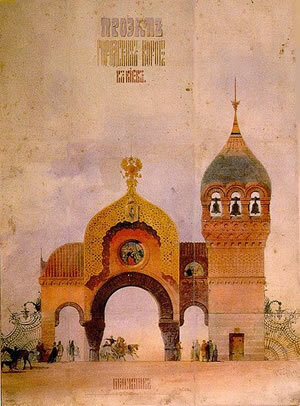 Mussorgsky’s ceremonial movement ‘The Great Gate of Kiev’ was inspired by an architectural drawing by Hartmann for the city gate of Kiev, and provides us with a striking example of Russian imperial censorship exercised during this time. According to contemporary accounts, a competition was announced to commemorate the date April 4th 1866. What the censors withheld was that, on that day, the Czar narrowly escaped an attempted assassination. Hartmann’s design - an arch resting on two columns with the intention of sinking to the ground or even collapsing - could be seen as a contemporary critique on the abuse of power exercised by Russia’s Imperialists and the City Council of Kiev’s commemoration for a monument. The visual component titled ‘Drowning Piano’ functions as a powerful motif evoked by Mussorgsky’s processional movement. 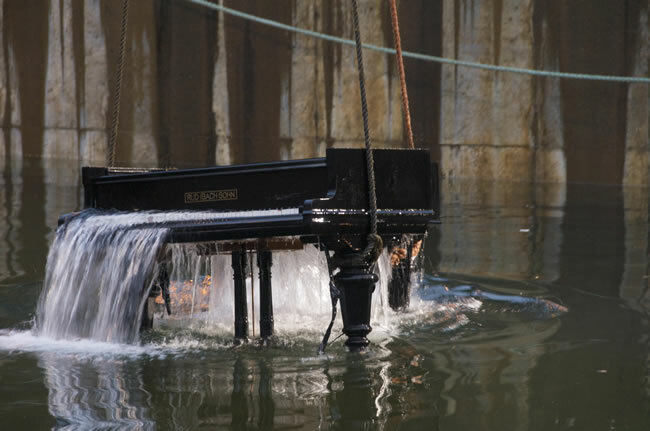 Here we see the piano being submerged in water, slowly drowning as water cascades onto the piano keys, then later into the piano. The relentless flow of the water into the grand piano acts as a metaphor of purging history. Once totally submerged the piano becomes a kind of lost treasure beneath the ocean. The piano as object becomes an antiquity of our time that at first has been hidden and then finally is discovered before our eyes. That last episode begins with the grand piano neatly positioned and anchored on the (still dry) floor of a dry dock. The workers are looking from the dock’s railing high above at the rusty metal catacomb below, where Andsnes packed in a yellow wind jack is playing the piano as if he is on a warm and intimate podium. But the dock does not keep dry for long. When the floodgates are opened the water almost violently gushes in. It gradually rises from the piano wheels up to the strings, until it reaches the instrument’s interior. The whirling water flood keeps rising, and all the while Andsnes is hammering out those fortissimo notes that symbolize the Great Gate of Kiev. 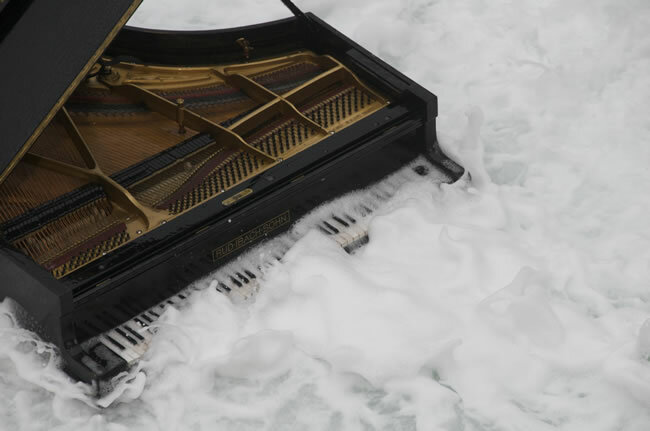 The final stage of the drowning process is introduced by the piano lid which closes spontaneously when attacked by so much water. The still impressively looking concert grand gradually disappears under the water surface. What remains is Rhode’s green colored underwater filming, with the grand still firmly anchored on the floor of the flooded basin. 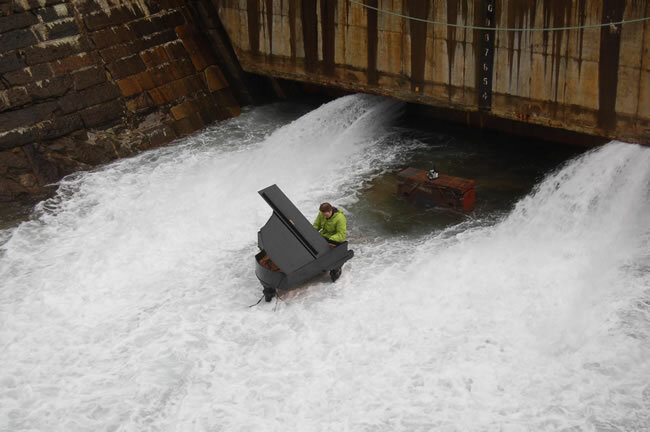 Andsnes found this drowning scene a gorgeous image, as he on his turn showed that he had made a big sacrifice for this project by giving up the piano. 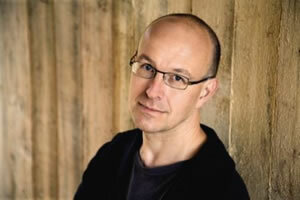 According to the Austrian composer Thomas Larcher (1963) his composition What becomes (commissioned by ECHO and the third work on Andsnes's program, just preceding Pictures), is a piece in five movements for unprepared piano (or at least only slightly prepared), because it is presented in a program without intermission. In his view it would have been awkward if Mussorgsky’s Pictures had to be played on an instrument which had become out of tune while being prepared! Larcher started the work by composing its second movement, Parabolic Bikes, first. It refers to an older Rhode animation on the one hand and to the jazz player Lennie Larcher on the other. The line with which the movement begins comprises many sub-lines and rhythmic models. This is why the line is divided between the left and the right hand very carefully. In the course of the piece this voice-leading becomes even more important and evident, the tempo gradually slows down, the atmosphere gets more and more melancholic. He added the introduction, Wertfrei, a flugelhorn melody, exploring the sound in the piano with the aid of the pedal, one of the inventions that made the piano a piano; and a whole world opens up in the instrument’s intestines. This Scherzo movement is not accompanied by animations but in a way is extending the animation: here the conflict, the drama and the horror of Rhode's animations, is pointed by making it musically explicit: Larcher had to shout it out. A further promenade (Isaac, referring to the renaissance composer) leads to the end of the piece (Paper Planes) where the subtle playing inside the piano and on the keyboard reminds us of the beginning. After six performances in the US and Canada (the work was premiered in New York on November 13, followed by performances in North Carolina, Washington, Houston and Calgary), the Brussels audience got the honor of the European premiere on November 24. In a fully packed house (Center for Fine Arts, Heny Le Bœf Hall) the lights had been carefully dimmed, with just a a few dimmed spotlights directed to the keyboard. The stage itself was almost gloomily kept in the dark, with Rhode’s six graphically printed large panels orbiting the stage. Yet, without any musical sound and without any moving image, the atmosphere in the hall was intriguing, if not somewhat gloomy. Some scenes reminded me of the recitals by the Russian pianist Sviatoslav Richter, his figure hardly visible, with only his face and the keyboard just dimly illuminated.. I had already watched the video on the EMI DVD and although I was quite impressed by Rhode's imaginary graphic art work, it was Andsnes's playing that overshadowed each and all. But here, in Brussels, it would be a more or less three-dimensional multimedia display which could unleash a tremendous visionary energy even superseding my wildest expectations. It could easily happen that what I was going to see would be paramount, with dear Andsnes being overthrown by Rhode's busy video images. But the big surprise was finally mine: Andsnes played so magnificently that the music ran its own supreme course. Andsnes's playing was a marvel: illuminating, razor-sharp, the phrases sensitively shaped, almost improvisatory at times, with an adamantine strength that created new worlds of sound and vision. Andsnes's playing was on the scale of Sviatoslav Richter, with that sheer combination of blazing technique and superb poetic and structural insight, prompting most beautifully shaped cascades, as they seemed to emerge out of the sky. This interpretative genius with his masterly control of dynamics rewarded his audience with a far-fetched musical journey in a most ravishing setting of tone colors. An important contributing factor was the he hall's warm acoustic, which allowed for the luminous sonorities to materialize with great power and zest. We got a second-to-none performance of Mussorgsky's Pictures and we got no less of Schumann's Kinderszenen, which equalled my one and only favorite in terms of sheer magic: Radu Lupu's, with Martha Argerich running very, very close. This was all about affection and transparency, delicacies and poetry. With so many aurally ravishing beauties reaching my ears I forgot most about Rhode's poignant and in some ways even daunting, mainly black-and-white video, leaving me primarily with Andsnes's stunning achievement. 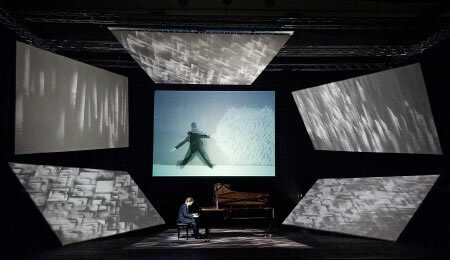 Those five panels in pensive shades of gray and the central video projection screen in the middle did not only create Andsnes's 'working space' for his gorgeous interpretations, but the overall dark setting also offered the audience great moments of concentration or repose. Andsnes gave Larcher's What becomes its premiere performance in New York on November 13, and it was - as far as I have heard - well received in Lincoln Center's fully packed Alice Tully Hall. Well, it is a rather tumultuous and virulent piece of about twenty minutes filled with postmodern phrases and harmonies, ranging from Schubert to Copland and from the Renaissance to Cage. Yes, Cage, because the pianist is expected to shorten the strings by hand, to change pitch and to add some scratching sounds here and there. The brilliant piece needs a frenetic performance to take off, but who could expect anything else under the hands of the virtuoso Andsnes? The loud yelling and whistles after the performance in Brussels might one associate with the presence of a very enthusiastic young generation, but the traditional applauding wave was no less loud and clear. Both artists had to return five times before the public went to the exits at last. The next morning, at the breakfast table, Rhode had his reservations nevertheless: "Yes, we got lots of applause, but I must say that outside the building I heard remarks I would rather not have heard at all. I don't even want to repeat them here, in front of you. Frankly speaking, the reception overall in the US was mixed, but what I heard here... Sorry." I gave him some comfort: "You know, Robin, any object of art stands on its own, has its own unique identity, and no one can take that away. Just assume that it reflects in quite a positive way in thousands of people seeing or hearing it." He gave me a big smile and walked away to join Andsnes, the salmon and the orange juice. Both the DVD and CD released by EMI Classics offer such lifelike sounds and images that you might at least applaud after this incredible performance. As in Brussels the Steinway Grand at the Risør Chamber Festival (a quickly sold out annual artistic joint venture in which Andsnes actively participates) was, like in Brussels, a most lucky shot again, with a very impressive sound resonance and a huge variety of instrumental colors. Time will tell if Rhode's video project will stand the test of time. The chances are there that it will quickly wear itself out, and that another new project needs to be developed to nourish audiences all over the world with new visionary refreshments. We shall also have to wait and see if a new generation will change its course from pop concerts to classical music concerts, albeit on their own terms. Or maybe both, with or without video projections to partner the music. I am not that optimistic because one thing is absolutely sure: musical education must start on elementary school level and this is just not the case. In the meantime we should be more than grateful that we have Leif Ove Andsnes playing the stars from the heavens and that we can highly enjoy his performances, with or without Robin Rhode's imaginative and magnificent art work. 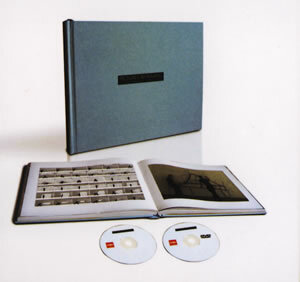 152-page book of full-color art prints by conceptual artist Robin Rhode. 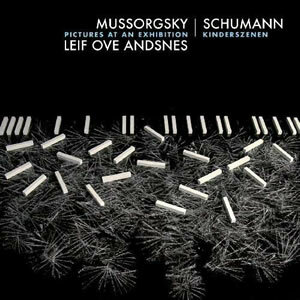 CD: Studio recording by Leif Ove Andsnes of Mussorgsky's Pictures at an Exhibition, From Memories of Childhood (Nurse and I | First Punishment: Nurse Shuts Me in a Dark Room | Rêverie | Near the Southern Shore of the Crimea, 1880), and Schumann's Kinderszenen. DVD: includes a 50-minute ‘making-of’ documentary Leif Ove Andsnes - Reframed (recorded June 2008-June 2009 and produced by NRK - Norwegian Broadcasting Corporation) chronicling the journey of Leif Ove Andsnes and Robin Rhode in creating Pictures Reframed as well as a full length performance of the work. A single audio CD release of this Leif Ove Andsnes recording is also available. Digital album to include audio commentary by Leif Ove Andsnes and Robin Rhode as well as full length performance footage. Pictures Reframed was recorded at the Risør Chamber Music Festival, June 2009 (DVD) and Henry Wood Hall, London, December and June 2009 (CD).